A pallet is a horizontal platform typically affixed to a superstructure and a bottom deck which allows it to be lifted and moved by material handling equipment such as lift trucks and conveyors, as well as to be placed in appropriate storage systems and transport vehicles. The pallet provides the base for assembling, storing, handling, and transporting materials and products. Additionally, a pallet provides protection to the product on it. The pallet is the most common base for the unit load. The unit load is a system which includes the pallet, goods stacked atop it, as well as the stretch wrap, adhesive, pallet collar, or other means of unit load stabilization. The history of pallets has been integral to the development of modern logistics. Additional refinements were added to pallet design and management during World War II. For example, pallet reuse in the supply chain became increasingly practiced. The pallet pooling concept began to be seriously discussed during this time and has evolved into a key strategy for pallet suppliers. What materials are used for pallets? There are various common pallet materials. The wood pallet dominates the marketplace, followed by other materials, including plastic, paper, wood composite, and metal pallets. Wood pallets offer a great combination of weight, stiffness, durability, and cost. In addition, there is a widespread pallet recycling infrastructure which helps promote the refurbishment and reuse of wood pallets. Custom pallets sizes can be easily fabricated from timber components. Plastic pallets typically are more expensive than wood pallets for comparable applications but are valued for such attributes as extreme durability, the precision of manufacture, and ease of sanitation. Other important buying considerations include pallet weight, and considerations for export pallets, such as ISPM-15 compliance or exemption for international shipping. Plastic is the second most common material used for pallets. Plastic pallets can be composed of durable, high-performance design, or lightweight and inexpensive, suitable for export. Non-timber pallets are exempt from ISPM 15 requirements. As such, they have become increasingly popular for export. What are the main pallet designs? 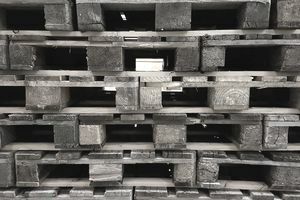 The National Wooden Pallet and Container Association's Uniform Standard for Wood Pallets begins by classifying pallets as either stringer or block. It then goes on to differentiate the common entry types of wood pallets, which refers to how many directions they may be entered by pallet trucks and forklifts. These include two-way entry pallets, which can be entered at either end; four-way pallets, which can be entered from all four sides; and partial four-way entry pallets, which can be entered by forklifts and pallet trucks at each end, but only by forklifts through notched stringers on the sides. Pallet style refers to whether a pallet has a single or double face (single or both top and bottom deck), and whether a pallet is reversible (either side can be used for the top deck) or non-reversible (having top and bottom deck but only one intended for use as a top deck). The standard also discusses top and bottom deck options. A single-faced pallet is also known as a skid. Nestable skids can provide additional benefits such as empty pallet stacking efficiency, for example, having a three to one stacking ratio. What are the main pallet sizes?